Back in 2016 before giving my first speech at my local Toastmasters club, I emailed a draft of my speech to my assigned mentor, Jason. Jason is a seasoned member of our club and has given dozens of speeches over the years. He had developed a keen eye for how to craft an effective speech. Jason redlined through several paragraphs of my speech and typed a note about getting right to the point. I accepted his input and rewrote the speech. Had I not worked with a mentor and had I done it on my own, I would probably have droned on and on about things that are interesting to just one person — me — and barreled through the four- to six-minute time limit. In the field of court reporting, I am a mentor to several students through both NCRA and the New York State Court Reporters Association. I try to give them the same beneficial insight in reporting as Jason gave me in Toastmasters: to avoid pitfalls, discover best practice habits, and stay disciplined and focused. I’ve heard anecdotes of students spending precious time in useless practice habits like sitting in front of a television and writing the news while the writer is turned off. (How do you know what you are writing?) A student may think that is effective practicing, but without the feedback of either paper notes or a realtime display, it is just a vain exercise. All of us know how hard court reporting is. In fact, speedbuilding can be just as nerve-racking as public speaking. We can all empathize with the student who has been stuck at a particular speed for what feels like eons, and the bitter disappointment of failing that speed test week after week. That student may be just one more failed test away from jumping ship and abandoning a significant investment of time and money. The difference between walking away in frustration and becoming a successful court reporter often hinges on wise input from a mentor. Mentors guide students, and they offer encouragement and practical advice based on personal experience. When a student works with a mentor, that student has prime access to an individual who has mastered the craft of court reporting and worked in the field long enough to know a thing or two. A well-qualified mentor has operated in a wide variety of settings and has faced and survived both the tedious routine and the exciting challenges that can happen in the course of a court reporter’s day. Think of a young voice student who had the chance to work with the legendary opera singer Luciano Pavarotti. Pavarotti had a passion for singing and for encouraging young singers to refine their craft. He not only performed in major opera houses across the globe, but he coached many voice students as well. Whether a reporting student needs help, an occasional pep talk, or a serious high-voltage motivational speech, the mentor is willing to commit the time and to be responsive to the student’s needs. It goes without saying that the student must be equally committed and willing to put in his or her due time and effort. Remember, this is a volunteer effort. Time is valuable to us all, and being a mentor means being willing to give some of that precious time for free. Likewise, the student needs to respect the time and energy given by the mentor for his or her benefit. I have a mentee* who occasionally sends me her transcribed assignments to look at the punctuation. While reviewing a jury charge, she had put in so many underscores denoting drops that I had to stop marking the grammar. Instead, I wrote a note in red ink: “It is critically important that you practice at a speed you can actually get down.” Her practice habits were not going to yield much success if she continued practicing at too-high speeds, dropping too many words, and trying to learn punctuation from incomplete passages. Communication is key for a mentoring relationship to be successful, whether it happens by email, phone, text, video conference, or in person, if possible. Each week I send an email to a list of more than 90 students and working reporters. The email may cover anything related to the field. After coming back from NCRA’s convention in Las Vegas, I wrote a lengthy piece summarizing my experiences there. Being a mentor means sharing your professional expertise to help a student reach his or her goals. Being a mentee means receiving valuable tutelage, for free, from a pro who has already been there. So go ahead and sign up. Your future may well depend on it! Joshua Edwards, RDR, CRR, is a captioner in New York, N.Y. He can be reached at joshua@jbreporting.com. Most of the discussion about mentoring revolves around students. Court reporters and captioners remember how difficult school was and recognize students’ need to have someone to go to for support and advice. But what about after school? 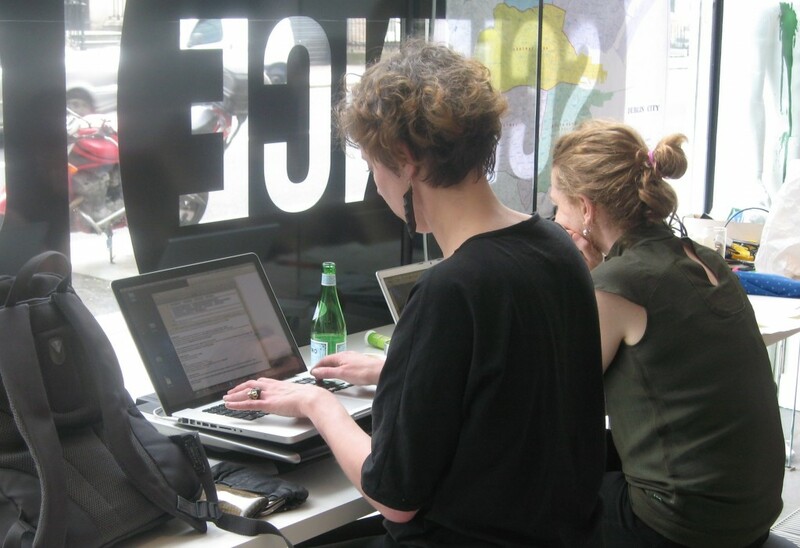 Reporting and captioning success in the real world require some measure of business skills. This becomes especially important if a reporter or captioner finds themselves operating as a one-person shop or running or owning a firm. Kerr’s desire for a mentor isn’t a new concept in the business world. Sometimes this comes in the form of a peer mentor and sometimes it comes in the form of a mastermind group. Thayer found a mentor in the previous owner of the firm, who stayed on for another couple years working as a reporter. “The greatest benefit was I was able to call and ask her about the business when something came up, so I had direct access to answers,” said Thayer. In a 2013 article for Forbes entitled “7 Reasons To Join A Mastermind Group,” Stephanie Burns describes a mastermind group as “a group of smart people [who] meet weekly, monthly, daily even if it makes sense, to tackle challenges and problems together. They lean on each other, give advice, share connections, and do business with each other when appropriate.” Burns is the founder and CEO of Chic CEO based in San Diego, Calif. She lists advisement, collaborating, extending your network, and cross-promotion as some of the reasons to form a mastermind group. “By interacting and sharing your challenges, it’s almost certain that someone in your mastermind will have a solution for you, and you may also be able to offer a solution, connection, or tactic to help another in the group,” Burns said. Previous experience with a professional group is what got Kerr started in thinking about finding a mentor. “I became involved a couple of years ago with 4word, a Christian professional women’s organization that promotes mentors in the workplace, and that is when I first became aware that even working women need mentors, and it gave me the idea to reach out to the listserv,” said Kerr. NCRA members and staff are all part of the service economy. 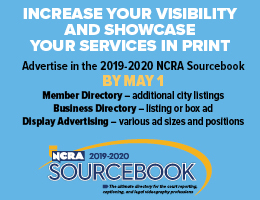 NCRA members are keepers of the record, and NCRA staff serves its members. The profession has service in its blood, so NCRA is encouraging all members and staff to take part in #GivingTuesday on Nov. 29. #GivingTuesday, an annual day of giving following Black Friday and Cyber Monday, was created in 2012 to empower a new community of philanthropists. #GivingTuesday is based on the concept that anyone, anywhere, can be a philanthropist. Participants don’t have to be billionaires to participate, and they don’t have to give funds. Giving can mean money, time, advocacy, or education. For many students, typical daily expenses combined with the cost of tuition means NCRA membership falls outside their budgeted expenses. Often when students choose which bills to pay, membership in NCRA falls off the list, despite the fact that being a part of the national association provides numerous resources, such as access to professionals for support and other benefits, that can help lead to finding jobs when they have graduated and are furthering their professional careers. The National Court Reporters Foundation raises funds throughout the year to support programs created to benefit the greater court reporting community. NCRF also awards four scholarships and grants to court reporting students and recent graduates each year. Donate to NCRF by calling 800-272-6272. NCRA is committed to excellence both in the court reporting profession and in the next generation of court reporters. To this end, the Virtual Mentor Program brings working court reporters and students together, so students can get the guidance and encouragement they need and today’s court reporters can nurture the future of court reporting. Download crTakeNote.com brochures and posters. Put up posters at local schools, libraries, and coffee shops. Do a presentation about becoming a court reporter for high school students, parents, and/or school counselors. Talk to a neighbor or friend about court reporting careers. Volunteer to serve on an NCRA Committee or in a leadership position and give back to the profession, make new friends, and establish new networks. Learn 30 more ways to give back on #GivingTuesday. Share how you plan to give on social media by using the #GivingTuesday and #crTakeNote hashtags. New court reporters face a variety of obstacles that can derail their careers. These barriers range from meeting speed requirements in their training programs to getting established in their first full-time role. Psychologists have known for decades that one important factor that helps successful people overcome their challenges is resilience — an ability to bounce back from setbacks. You can enhance your resiliency and thrive in your new career by partnering with a mentor. 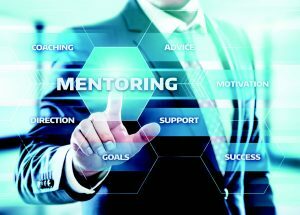 In this article, we explore mentoring as an essential ingredient for helping you increase your career resilience and successfully enter the court reporting profession. You will gain insights on what mentoring is, how to find one, and tips for working with your mentor. Mentoring is a partnership you can form with an experienced professional focused on your development and career success. This partnership is a relationship between you and your mentor where you both agree to cooperate as a way of advancing your mutual interests. Mentors agree to serve in this role because they want to help advance the profession and often gain enjoyment from helping people grow. As a mentee, you are interested in successfully completing your court reporter training and getting established in your first role. While many new court reporters rely on social media, such as Facebook, to get support and answers to their questions, some prefer an on-going trusting relationship with a mentor. Your mentor can play an instrumental role in helping you complete your training and get established in your first role. While you should focus the mentoring partnership on your unique needs as a mentee, there are some common situations where mentoring can help. Making a decision to enter a profession can be an overwhelming challenge without the right information. Career changers interested in becoming a court reporter may choose a mentor to help them determine whether it’s the right profession. Activities like shadowing experienced court reporters to observe what their day is like or conducting informational interviews with seasoned court reporters to learn more about the profession are great ways to find out if the profession is for you. Another way that mentors provide support to students is in the form of emotional support. Rachel Barkume, RPR, is an official reporter based in Oakhurst, Calif.. She explained “family members don’t understand what court reporting school is like — every day we had pop quizzes that we had to pass as we built our speed. Even when you pass a speed test, the next day you have to work toward the next milestone. It can be very discouraging.” In these situations, a mentor can provide a supportive ear and validate the emotions experienced by a new student. By doing so, students are better able to sustain their perseverance to finish their training programs. Steve Zinone, RPR, NCRA President and official reporter in Canandaigua, N.Y., adds that experienced mentors can also provide students “a light at the end of the tunnel” to help them maintain their resiliency with a clear vision of what life will look like once they complete their training program. Newly trained court reporters often experience stress in identifying their reporting focus as well as facing the realities of their first job. With the number of specialty areas available to court reporters as well as types of organizations that provide this service, people who are new to the profession can feel overwhelmed. Mentors can also help early career court reports explore and identify career options. What are your goals or challenges for which a mentor could help? How often do you want to interact with a mentor (e.g., on a regular schedule or as needed)? Do you have a preference for the geographic location of your mentor? How do you want to interact with your mentor (e.g., email, in-person, telephone, Skype, etc.)? Are there certain qualifications or experiences that you would like your mentor to have? Once you reflect on these questions, you can more easily communicate your needs to prospective mentors. You have decided that a mentor could be helpful and clarified your goals. So how do you go about finding a mentor that is a good match? Whatever approach you use, it is useful to have an exploratory conversation with a prospective mentor to learn more about each other. During this conversation, you will also communicate your needs and goals. Ideally, the potential mentor will be a good match. However, it may be that the prospect is not a good fit. In this case, you might consider asking that prospect if he or she knows others who might be a better fit. How often will you meet and using what communication channel (e.g., email, in-person, telephone, Skype, etc.)? Who will initiate the communication? What is the overall agenda for each call? What are the boundaries related to confidentiality of the information you share? What happens if a crisis emerges and you need to cancel a meeting? How much notice do you need from each other? If the mentoring relationship is not working out for you or your mentor, how will you handle it? Mutual respect is a key ingredient of strong mentoring relationships. Mentors are there to support your success as a new court reporter. As part of their role, they may likely provide advice and suggestions. One way you demonstrate respect is listening to your mentor’s suggestions, maintaining a positive attitude, and taking action on the commitments you make. By taking action, you are communicating your respect for your mentor and his or her professional wisdom. By doing so, you are establishing a positive reputation for yourself in the profession. While some court reporters create mentoring partnerships in which they communicate as needed when they face a particularly challenging issue, the best mentoring relationships incorporate regular communication. Many mentoring partnerships start off with more frequent contact then cut back once the relationship is solidly in place. Lisa Johnston, RMR, CRR, CRC, a CART captioner in Melbourne, Fla., advises mentees that “communication is key, and it is important for mentees to reach out to a mentor and not be shy about asking questions.” Johnston described how she interacted through email with one of her mentees every two weeks. The goals you initially identified when you began the mentoring partnership may well change as you grow and develop. If you no longer have a need for your mentor because your goals were achieved, communicate this to him or her. Avoid the temptation to drift off and abruptly stopping communication with your mentor. Again, this is another way to demonstrate respect for your mentor. Many experienced court reporters act as mentors because they want to give back to the profession. However, your mentor has his or her growth and development needs too. One way to build a strong relationship that could last a lifetime is to pay attention to ways you can support your mentor. Perhaps you found an article that might interest them or met someone who would be a great networking contact for your mentor? Despite being new to the profession and possibly still being in school, no doubt there are others following in your footsteps who you might be able to mentor. Not only will you be supporting the court reporting profession, but you will also deepen your learning as a mentor. Zinone explained how rewarding it is when one of his mentees has developed his or her professional support network, becomes more confident as a court reporter, and begins to mentor others. Entering the court reporting profession can be a demanding and rewarding challenge. The training programs are rigorous. Once you finish your training, there are many ways to launch your career in varying types of organizations. Resiliently bouncing back from setbacks you may face is critical to your success. By establishing a well-designed mentoring partnership early in your career, you can fulfill your dreams of becoming a successful court reporter. Dr. Kevin Nourse is an executive coach and consultant based on Washington, D.C., and Palm Springs, Calif. He works extensively with associations to develop resilient leaders. Kevin is co-authoring a soon-to-be-released book with Dr. Lynn Schmidt entitled Shift into Thrive: Six Strategies for Women to Unlock the Power of Resiliency. The JCR Awards were created as a way to highlight the innovative and forward-thinking practices of NCRA members and to recognize how court reporters, captioners, and legal videographers are leading the profession. These individuals and organizations are being recognized as being the best-in-class for the noted categories. From left to right: Wendy Evangelista, Claudia Booton (sitting), Judy Stevens, Rachel Fox, and Chandra Monis. Judy Stevens, who owns Stevens-Koenig Reporting, was nominated by several reporters and staff members, who shared stories of her leadership and drive. “I’m one of four reporters who are tag-teaming an unusual trial case. Judy’s help in guiding me through what is outside of my comfort zone is quite reassuring,” wrote Becky Collings, RPR. “I recently passed the Colorado Realtime Certification test, and Judy is getting me ready to start that next journey of my career.” Several of the nominations also spoke about the meetings, often held at her home, where reporters can get together to socialize and ex- change steno briefs. Stevens has also brought in realtime trainers or motivational speakers for her staff and reporters for these gatherings, which have built a strong support network for everyone. Debbie Weaver of Midwest Litigation Services has been actively involved in supporting equal access to justice through a number of pro bono organizations in St. Louis. One of the organizations the company supports is Let’s Start, a program dedicated to assisting women and their children in the transition from prison life to society. The company supports this group by volunteering at annual fundraisers and supplying packed lunches for a bus ride to take the children to the local prison to visit their mothers. In addition, the company has participated with the Bar Association of Metropolitan St. Louis in Read Across America, a literacy program; Motion for Kids, a party thrown for children who have parents affected by the criminal justice system; and other events. White Coat Captioning screen from ! !Con 2015. Knight went on to explain that the company has been focused on the conference captioning work because it hopes to change the status quo, where the only way to get captioning was for a person who was deaf or hard of hearing to invoke their ADA rights. 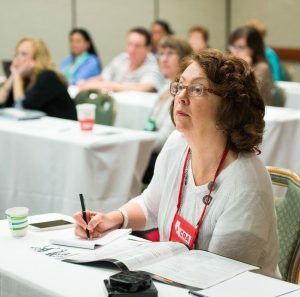 “One in seven people has hearing loss,” notes Knight, “so in an audience of 100 people, at least 14 will benefit from captioning.” White Coat Captioning seeks to make captioned conferences the new standard for conferences. Christine Phipps caught in a relaxed moment during the workday. “Her passion is so contagious!” wrote Sherry Laurino in her nomination of Phipps. Laurino went on to say that it was Phipps who inspired her own entrepreneurial skills. “No one has more passion and love for court reporting and is committed to the growth and longevity of this industry,” Laurino said. When she is preparing to meet a new client and show what her company has to offer, Phipps will go above and beyond to make sure the client understands and is satisfied. Even with other reporters, Phipps takes the time to update them with anything new and explains it. In addition, she has taken the time to write several articles on technology for the profession to make sure that everyone is aware of the latest trends and news. “She is dedicated to teaching while not forgetting where she came from,” wrote Laurino. One of Phipps’ passions has been to help students of the profession and new profession. She led a charge to provide a number of students with memberships to NCRA in 2015 with posts about “Paying it forward” to the next generation, as well as donating several of the memberships herself. “As her employee now, I have nothing but admiration and respect for her. She has been nothing but supportive, respectful, loyal, open-minded, and just an amazing person to work for,” said Andujar. During 2015, the Varallo Group offered its employees a fitness program, which gave them the opportunity to establish health goals and meet and work with a personal trainer. The program was a huge success and produced immediate results that were clearly measurable, including weight loss and decreased absenteeism. An added benefit was that the employees grew closer through their shared experiences; for example, several employees ran together in their first-ever 5k race. The nomination for Cuyahoga Community College noted its use of technology to enhance students’ academic success, realtime writing achievement, and program satisfaction. From attending an introductory webinar before deciding to sign up for the program to its Blackboard Learning Management System, from using computer-compatible steno machines from the first day of class to accessing drills through Realtime Coach, the court reporting and captioning program uses technology to increase student satisfaction and eventual success. Moranz is also in charge of recruiting new students for the program. Among the places that the school presents is a program called Women in Transition, which addresses women changing occupations or getting second careers later in life. When Iowa court reporters received the news that AIB College of Business, which had been in place since the 1930s, would phase out the court reporting and captioning programs, the Iowa Court Reporters Association (ICRA) immediately went to work. The ICRA Board of Directors engaged Cathy Penniston, RPR, CRI, to investigate the matter, compile a report on successful court reporting schools throughout the country, and suggest a school in Iowa that could teach court reporting. Penniston recommended contacting Des Moines Area Community College (DMACC), a well-established Iowa community college, to determine if it could create a court reporting program. When Stephanie Early, RDR, ICRA’s president at the time, and Bill Wimmer, its legislative representative, approached the school’s officials, they assured the school that ICRA was fully committed to assisting with the implementation of a court reporting program at DMACC. In 2014, Dr. Patricia Ziegler, CRI, CPE, was hired as a professor and program chair for DMACC’s new court reporting program, and in September of that year, eight students began classes at the Newton campus. Through 2014-15, Iowa court reporters and AIB’s former vice president of admissions actively promoted the new program. More than 300 visits were made to Iowa high schools, career fairs, libraries, mock trials, and the Iowa State Fair. Through the Adopt-a- County project, Iowa court reporters marketed the profession and this new program in 26 of 99 Iowa counties. In addition, ICRA sponsored a student scholarship, and individual ICRA members mentored individual students. And in September 2015, a new class of 27 students enrolled. NCRA wants to thank the many members who celebrated #GivingTuesday by devoting their resources to supporting the future of the profession. A number of members chose to sponsor student memberships in NCRA as a way to give back to the profession and support its future, according to the Association’s Membership Department. NCRA member Patric Martin, of Bethesda, Md., an official reporter for the International Monetary Fund for the last 27 years, said he chose to support a student membership because he remembers being a student himself. “As a working reporter, being able to help a student by sponsoring their NCRA membership is a fantastic and simple way to further our profession. I remember the struggles of learning the machine (don’t we all! ), so helping out in a financial way may make that just a little easier for them. And getting students involved at an early stage will also pay dividends down the road when they become the leaders the profession will desperately need to carry it forward,” said Martin. “It is vitally important that we support the next generation of realtime-trained court reporters,” said NCRA member Debra K. Cheyne, a CART captioner from Sherwood, Ore.
NCRA’s Education Department also reported an uptick on #GivingTuesday in the number of members volunteering to serve as virtual mentors to court reporting students. “The reason I feel it is important to mentor reporting students is, number one, I love this profession and want others to join us, and number two, I still remember the struggle and challenge of school 16 years later,” said Brandi N. Bigalke, a firm owner from Minneapolis, Minn.
“If I would have had someone who was working in the field at the time cheering me on, I think it would have been a very motivating factor. Family and friends just don’t truly understand this profession. As working reporters and captioners, we need to stick together, and that includes cheering on those in school. Because, let’s face it, they are the future of this profession,” added Bigalke, who holds the Realtime Systems Administrator certificate and current serves on her state association’s Freelance, Technology, and Captioning Awareness committees. Members interested in sponsoring a student membership can learn more at NCRA Student Sponsorships. More information about becoming a Virtual Mentor can be found at NCRA Virtual Mentor. NCRA members and staff are all part of the service economy. NCRA members are keepers of the record, and NCRA staff serves its members. The profession has service in its blood, so NCRA is encouraging all members and staff to take part in #GivingTuesday on Dec. 1. #GivingTuesday, an annual day of giving following Black Friday and Cyber Monday, was created in 2011 to empower a new community of philanthropists. #GivingTuesday is based on the concept that anyone, anywhere, can be a philanthropist. Participants don’t have to be billionaires to participate, and they don’t have to give funds. Giving can mean money, time, advocacy, or education. For many students, typical daily expenses combined with the cost of tuition means NCRA membership falls outside their budgeted expenses. Often when students choose which bills to pay, membership in NCRA falls off the list, despite the fact that being a part of the national association provides numerous resources, such as access to professionals for support and other benefits that can help lead to professional success. NCRF raises funds throughout the year to support programs created to benefit the greater court reporting community. NCRF also awards four scholarships and grants to court reporting students and recent graduates each year. Donate to NCRF by calling 800-272-6272. NCRA is committed to excellence both in the court reporting profession and in the next generation of court reporters. To this end, the Virtual Mentor Program is one way to bring court reporters and students together, so students can get the guidance and encouragement they need and today’s court reporters can nurture the future of court reporting. Put up posters at local high schools and community colleges. Do a presentation about becoming a court reporter for high school students, parents, and/or school counselors. Talk to a neighbor or friend about court reporting careers. Find 30 more ways to give back on #GivingTuesday. Share how you participated on social media by using the #GivingTuesday and #crTakeNote hashtags. Giving back to the profession does not require a significant investment of time or money. You might pen a simple post to your Facebook page telling the world what you love about your job or make a short presentation at your child’s school on career day. Take the opportunity where it presents itself. A friendly chat with a neighbor over the backyard fence or at a cocktail party could showcase our unique profession and perhaps become a life-altering encounter for a man or woman whose curiosity you’ve piqued. Here are thirty ways that anyone can do to give back to the profession. Acting on just one or two is bound to create a lasting impression that will benefit our profession and all of us in it. Tell someone new what you do for a living. Be enthusiastic! Court reporters, captioners, and legal videographers do interesting stuff. It’s great cocktail party conversation. Point out the TV captions in a public place, say at your gym, a bar, a hotel lobby. Ask your friends, do you know how those captions get there? They won’t know – but they’ll be curious to find out! Tell the attorney you’re working with why a court reporter’s impartiality matters. It’s part of what makes us special. While you’re at it, tell the nice attorney how realtime services can help him or her. 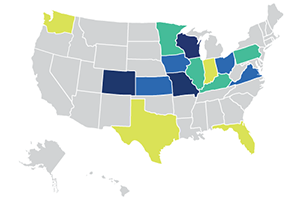 Sponsor a student member in your state or national association. Give a Career Day presentation at your local high school. Bring your steno machine and write to an iPad. Mentor a court reporting student. Offer to talk to a court reporting class about what life after school looks like. Give them good advice. Alert them to some just-out-of-school pitfalls to avoid. Be encouraging. Thank your Congressional representatives for supporting legislation that supports realtime, court reporting, and captioning. Talk to a class of law school students about the nuts and bolts of making the record. (Nobody else is going to tell them!) NCRF has materials to help you with this outreach. Thank the attorneys for hiring you, a certified court reporter, and tell them why certification matters, for court reporters as well as legal videographers. Certified means professional. Team up with a court reporter friend or two and put together a short primer of do’s and don’ts of making the record. Your local bar association will be grateful to you for the educational opportunity. Maybe your favorite law firm would like you to come in and address their young associates. Get bonus points for offering CLEs! Transcribe an interview with a veteran for the Library of Congress Veterans History Project. You can earn PDCs. And it is a very satisfying thing to do. Host a Veterans History Project event for veterans in your area. Do it at a court reporting firm or court reporting school. Get your community involved! People like to honor our veterans. Get involved with students on the NCRA Student Facebook page or other student networking sites. They’ll love it! An excellent way to motivate students. Sponsor a student’s attendance at an NCRA event. Write an article for the local ABA newsletter about what to look for in a court reporter. Or write a letter to a local community organization about the importance of accessibility for all citizens, especially our fellow citizens who are deaf and hard of hearing. Pass along your experience. Write an article for your state association newsletter or the JCR about a valuable lesson learned. Your readers will appreciate the heads up. Volunteer your services (or find volunteers) for your neighbors who are deaf or hard of hearing. They might love to have CART for church or local meetings. 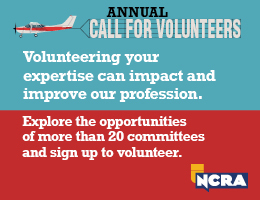 Volunteer for a state association or NCRA committee. A great way to meet people! Attend a TRAIN event, upgrade your realtime skills — and then help others do the same. Share your expertise with your peers; put on a seminar at a court reporting event. Sound scary? Okay, sign up to learn something new yourself! Send NCRA membership forms to court reporters you know who are not members, and tell them why they should be. Size matters. There’s power in numbers! Send a testimonial (written or video) to NCRA to support NCRA’s efforts to inform people about the benefits of court reporting as a career. 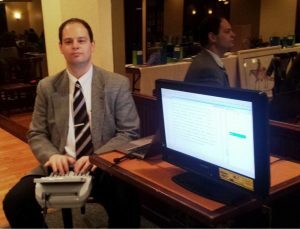 Write an op-ed for your local newspaper advocating for the use of stenographic court reporters in the courts; explain the value of captioning at community events. Become involved with your state CSR board. They need your expertise. And you’ll be surprised how much you will learn! Pay it forward. Remember to thank the people who’ve helped you along the way. Donate to the National Court Reporters Foundation, which will put your money to good use. Social media — Facebook, Twitter, LinkedIn — are great venues to tell people what you love about your job. No need to vent about rush transcripts and fast-talking lawyers. Create some positive buzz! Celebrate your profession, your career, the unique job you do where you are the expert. Be proud of your role as a court reporter, legal videographer, captioner, or CART provider. You are part of a long and proud history of service to the bench, the bar, and the public at large.